The 2017 Jaguar XJ features a luxurious, technology-filled interior that will keep driver and passengers comfortable and happy no matter the length of your journey. Multi-function seating includes significant front seat adjustability plus heating and cooling for both front and rear seats. Everyone will appreciate the amazing sound provided by your choice of two Meridian™ Sound Systems. In addition, the WiFi hotspot allows a connection for a variety of devices. The Jaguar InControl® Touch Pro™ infotainment system integrates with your smartphone to keep you connected no matter where you are. The Connected Navigation includes real-time data so you can get to your destination quickly. Rear seat passengers of the Jaguar XJ will enjoy the stowable 10.2-inch HD screens. Other innovative features includes a 12.3 high-def TFT Virtual Instrument Display which allows you to customize your display with one of four pre-set themes. InControl® Remote allows you to monitor your vehicle using your smartphone. This includes the ability to start vehicle or lock/ unlock vehicle remotely. The 2017 Jaguar XJ also features an impressive panoramic sunroof that filters UV rays while allowing the car to be filled with beautiful, natural sunlight. 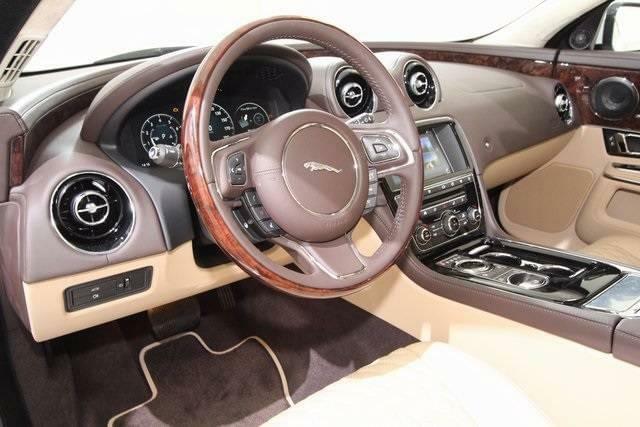 There are so many super features, you will want to visit Jaguar Colorado Springs to get to know all about them. Sit in the 2017 Jaguar XJ and test out the many features. Let our Jaguar experts show you how this vehicle can make any drive an enjoyable one.